Ms Edna Adan Ismail, the former Foreign Minister of Somaliland, visited Ireland to raise awareness about Somaliland’s sovereignty, as well as human rights and humanitarian issues affecting the country. 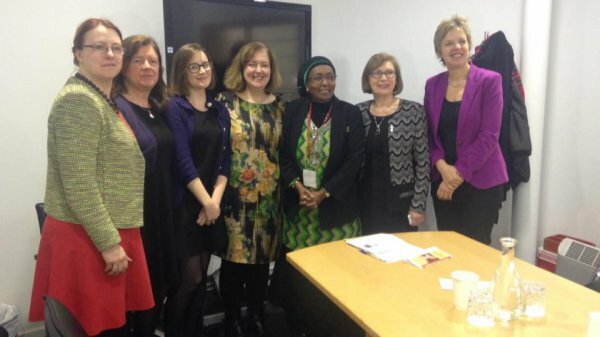 Edna Adan met with First Lady Sabina Higgins, Irish Parliamentarians and other Irish NGOs, discussing peace-building, the current drought and women’s rights in Somaliland, in particular the fight against female genital mutilation (FGM). Edna Adan also engaged with the diaspora community in Ireland, exploring ways in whichit can stimulate development in Somaliland in terms of investment and infrastructure. Ms Edna Adan Ismail has undertaken a four-day visit to Ireland in order to raise awareness about Somaliland’s sovereignty and to discuss human rights and humanitarian issues. Edna Adan Ismail met with First Lady Sabina Higgins to discuss the pressing global need to address maternal mortality and engaged in discussions on Somaliland, peace-building and women’s rights. Including Irish Parliamentarians from the Committee for African Affairs and Committee for Reproductive Health as well as with officials from the Department of Foreign Affairs and Irish NGOs. Edna Adan was warmly received at Somaliland Community Event in Dublin, which she outlined steps the community could take to support the cause of Somaliland and updated community members about recent developments in Somaliland, including the status of the fight against FGM and the drought affecting communities in Eastern regions. She was informed by community members about the challenges and achievements of the Somaliland community in Ireland and engaged in fruitful discussions on how to effectively raise funds amongst the diaspora community to stimulate development in terms of investment and infrastructure in Somaliland. Edna Adan also held a series of lectures in universities and hospitals which explored her work on maternal and reproductive health in the Horn of Africa. Edna Adan also participated in a number of media interviews.